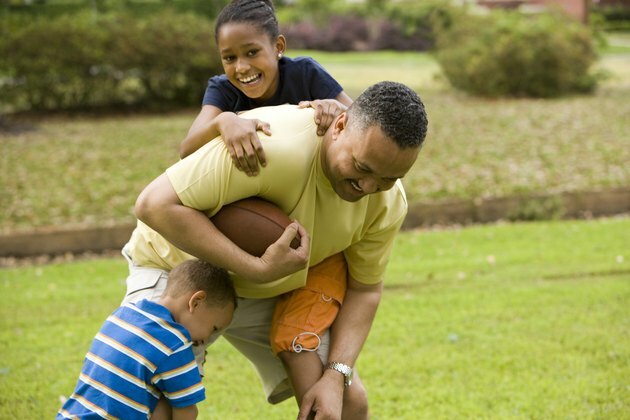 Keep your kids entertained as well as improve their throwing and catching skills with some outdoor football games. While a basic game of football can be played by kids of all ages, a variety of different types of football games help to break the game down depending on age and competition level. Flag football is a football game that can be played competitively as well as for fun. Divide a group of children into two teams. Have them place flag belts on their waists or several socks in the elastic of their shorts if you do not have belts. From here, engage in a normal game of football, pulling flags instead of tackling offensive players. You can either play using a timer or up to a set number of points. This game is designed to improve your child's kicking ability and skill. Stand a few feet in front of a field goal post and get down on one knee. Place the end of the football into the ground, holding it steady with your fingertip on top of the other end of the ball. Have your child step a few feet away from you, running up to kick the ball. Keep score of how many kicks he gets through the uprights. Touch football is a game designed for recreational pleasure and enjoyment. Have your children break up into two even teams and line up on the ball. After the quarterback says hike, he has the option of passing the ball or handing it off to the running back. The player with the ball is considered "tackled" when he is touched with two hands by a defender. If a defender touches him with only one hand, the runner is still not considered down. This game is designed to improve your child's throwing accuracy and precision with a football. Hang a tire from a tree with a piece of rope, choosing whatever height your child feels comfortable. From here, have your child step a few yards back and try to throw the ball through the tire. After 10 throws, have another child take a turn at getting the ball in the hole. The player with the most throws through the tire is the winner.